It's Sunday and I don't usually post anything on Sunday, but I have some free time and just realized I haven't told you about my soon-to-be garden! This is the first full summer in our house, and since our yard space is limited, I have decided to do a deck garden. I've seen them done and they are seem to work just fine, so I'm keeping my fingers crossed mine works too. 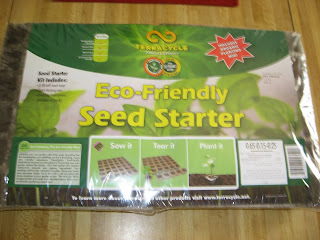 Here's the package for my seed starter, which have now been planted. According to the package, it will take 6-8 weeks for them to get big enough for me to transplant in my pots. 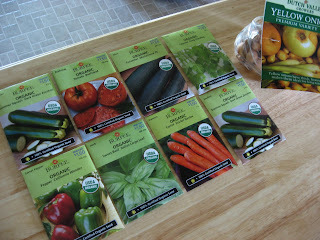 And here is my veggie/herb line-up. I didn't want to plant too much in case this is a HUGE failure, so I went with the veggies we eat the most and the herbs I use the most. I hope to get a large enough yield to make The Biggest Diabetic Loser's Baja Salsa, jar my own dill pickles with the cucumbers, can my own spaghetti sauce, and get enough zucchini to bake ump-teen loaves of zucchini bread and muffins. What can I say...let's pray. The husband picked up a large bag of organic potting soil yesterday for me, so I think I'm ready, just need to wait until after May 1st to plant, as that is when "they say" Iowa is out of the frost forecast. We'll see. In other news, guess what I'm doing today? Have a great Sunday everyone, and Happy Birthday to my nephew Hunter! I'm growing herbs for the first time too! Good luck with yours...and I'm jealous you are going to the Red Avocado...love that place in IC! Good luck with the garden - that's a great idea actually! While we have a big lot, sadly the deer and bunnies got to our stuff before we did! I may have to think about a garden deck! Have fun at lunch - and Happy B-Day to Hunter! Good luck with the garden, that's a cute kit! For two years I had pots of all fresh herbs on the back patio and they faired pretty well. It was great to be able to use them in dishes. But I accidentally left them out this past winter and they are as dead as dead can be -- oops! Have fun at your get together! Sounds fun!!! My boyfriend mention that peppers get soft and sweet when baked, so you may like them. 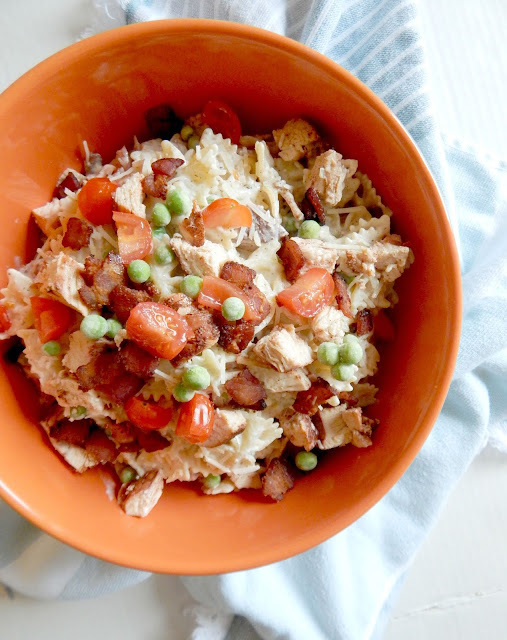 But the casserole idea sounds really really good too! I think it may be even better! More crunchy on top- which I prefer. Today was my first blogger meetup too! It was so much fun to actually meet my pals in person. Good luck on your garden. We have a bad habit of planting things and forgetting about them.... :) Maybe this year we'll do better. SO GREAT about your patio garden! Things will grow, don't worry. I WISH I could plant May1, I have to wait for June 1. Good luck! Oh that's so fun! I really need to look more into doing something like that!